I have been spending many hours this winter in my workshop carving away…busy handcrafting our Greenland kayak paddles. But, I’ve been working on something else, too…a new addition to our line of Greenland paddles. I am happy to announce…you asked for it and now we have it…our very own Greenland-style canoe paddle! The first one for the public is hot off the workshop bench. In fact, we have been so busy getting it done and getting ready for the show, that we haven’t settled on a name yet – that is still to come. But not wanting to hold back any longer, we are going to bring our new paddle to this year’s Canoecopia where it will make its debut in a FREE – yes, FREE - giveaway drawing for those attending the show. 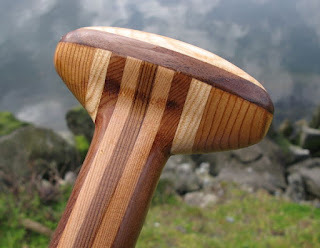 What is our Greenland-style canoe paddle like? Well, we adopted the same blade design as our Greenland-style kayak paddles to make a canoe paddle that will also be easier on your shoulders & elbows – making it possible to paddle longer with less fatigue without sacrificing speed. Each canoe paddle is handcrafted and fully laminated using different shades of Western Red Cedar. Then, as with most of our kayak paddles, we have added both hardwood tips & hardwood edges for additional armor. We then topped it off with a comfortable palm grip made of ash, walnut, and Western Red Cedar. The final touch…we’ve brought out the beauty of the wood with a hand-rubbed teak oil finish – making the paddle easy to maintain. So, there you have it…the beginning of our new line of Greenland-style canoe paddles. If you are at Canoecopia, be sure to stop by our booth (#L2) and see our first one for yourself (and to enter the drawing! ).